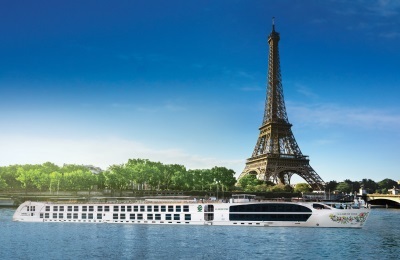 The S.S. Joie de Vivre is designed to reflect the “joy of living” as it cruises along the Seine River in northern France. This luxurious 128-passenger vessel features handcrafted furniture, sumptuous fabrics, beautiful antiques, gilded accents and every modern convenience. The Salon de Beaux-Arts Lounge will showcase a collection of fine art and antiques curated from renowned auction houses and private collections. The Le Club l’Esprit has a pool that can ingeniously transform into a dance floor or an outdoor cinema at night. Dining venues include Le Restaurant Pigalle and La Cave de Vins, a cozy nook for private dining and dinner with paired wines. The S.S. Joie de Vivre is intimately scaled so it can dock in the heart of Paris and approximately a 15-minute walk to the Eiffel Tower.